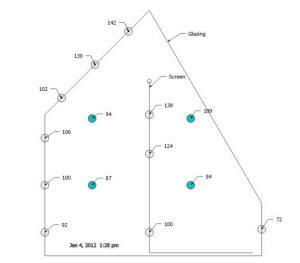 This section covers some tests done on a low thermal mass sunspace with a design optimized to produce solar heat for the home its connected to. Well designed sunspaces are exceptional in that they not only provide solar heat to the house, but they can serve a variety of other purposes -- lounging, reading, clothes drying, wood drying, plant growing, ... But, you have to wonder how good a job of providing heat do they do when they are also doing so many other things? These tests attempt to answer that question -- and more. 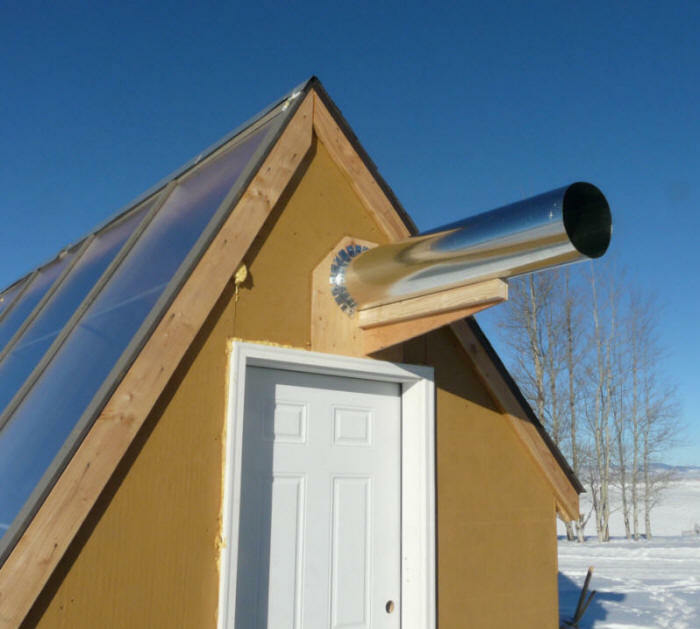 How efficient this sunspace design is in producing heat for space heating an attached home. Compares the efficiency of this sunspace to conventional solar collectors. Looks at the effect of some design variations on heat output. 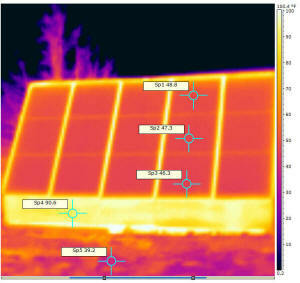 Provides a survey of the temperatures in various parts of the sunspace in the sun. Covers some of the things that can be done to maximize the use of the sunspace for a variety of purposes (producing heat, pleasant place to spend time, drying laundry, ...). Bottom line is that you will probably be pleasantly surprised about how efficient a heater a well designed sunspace can be. If you have a sunspace, I'd very much like to hear what your experience has been (good or bad), and what your ideas for improvements are. The greenhouse is freestanding and does not share a wall with the house. Given that the back wall is well insulated, I don't think that this makes much difference in the results. The heated air is just blown out into the great outdoors through those odd looking ducts above the door. The sunspace is too far away from the house to duct the hot air to it. I don't think this makes any difference in the results. The intake air is taken from outside, so its much colder than it would be in an attached sunspace where it would be (say) 65F air from the house. This does effect the results. The consequences of the cold inlet air are discussed in the performance section. All of the things like insulation levels, thermal mass, wall colors, interior configuration were set up to optimize sunspace performance, and may be changing when its converted into its greenhouse role. Bottom line is that I think that using the greenhouse as a sunspace simulator gives good results, and there is so little actual performance data out there on real low mass sunspace performance that its quite useful. The sunspace performance tests were actually done in our new all-season greenhouse. 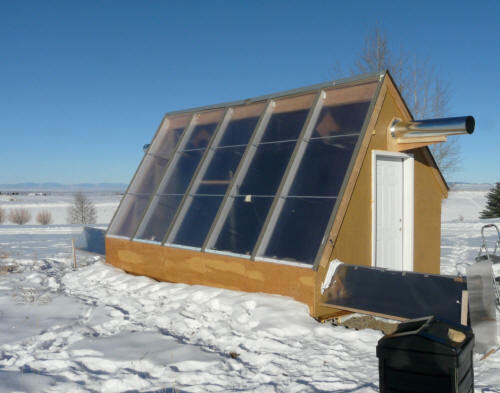 I've had a long term interest in seeing how well an attached, low thermal mass sunspace actually performs compared to (say) active solar collectors, and the greenhouse has a lot of the same features, so we decided to use it to do some sunspace performance tests before it becomes a greenhouse. A 200 sqft glazed area that is oriented at a 60 degree tilt angle for maximum winter solar gain. The glazing is double wall polycarbonate for better winter performance (lower glazing heat loss). The glazed area is just about equal to the total floor area. Surfaces that do not receive much winter sun are not glazed as they might be in a 3 season greenhouse. This is to reduce the heat loss through the glazing, which is high. The sunspace has very low thermal mass so that the bulk of the incident solar heat is carried off to the attached house, and very little is stored in the sunspace mass. All non-glazed surfaces are well insulated. The walls and ceilings are insulated to R28, and the floor has vertical insulation around the perimeter as well as 1.5 inches of floor insulation. The sunspace is well sealed against air infiltration. All inside surfaces that see the sun are painted dark to absorb the sun. These surfaces are also low mass, insulating surfaces that heat up very quickly when the sun is on them. This results in rapid heating of the air next to the surface The heated air then rises up to the peak area where the fan and ducting export the heated air to the space to be heated. The end result is a space that heats up very quickly when the sun gets on it-- it is ready to start making heat for the attached house as soon as the sun is on it. And, at the end of the day, when the sun goes off the sunspace it very quickly cools to the outdoor temperature, because it has no stored heat. This may conflict with some sunspace uses, and compromises can be made if these uses are important to you, but this test just wants to find out how good the sunspace can do as a heater with the design optimized for space heating. 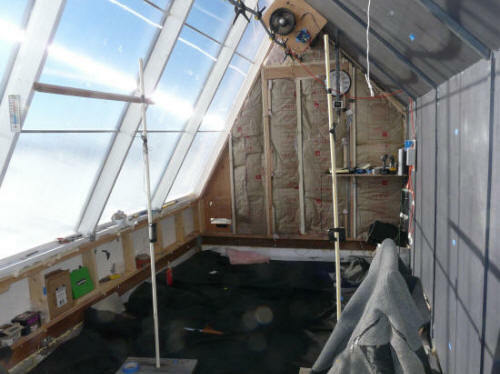 The pictures below show the sunspace/greenhouse build -- more pictures here... Bear in mind that this sunspace setup is for performance tests only -- you can make your sunspace much more pleasant to be in with nicer finishes. Its also possible to do very simple sunspace that cost next to nothing, but still produce a lot of heat. See the Sunspace Section for examples of both ends of the spectrum. Concrete footing post support the sunspace. Built on treated lumber sill plates. Framed with 2 by 6 lumber 24 OC. polycarbonate glazing in 4 by 10 ft sheets. 200 sqft of glazing total. or plumbing to deal with. insulating curtain was added to the glazing. "oops" pile at Home Depot. that push air out of the sunspace. in one of the configurations is also visible. Setup for one of the tested configurations. between fabric and north wall. and picture taken on south side of the fabric. The vertical PVC pipe has two temperature sensors. Looking west with weed fabric on floor. Sunspace on one of the test days. of inlet air a bit. Several days of performance testing were done -- the section just below links to pages on three of the most useful test days. This configuration included all of the features listed above. The walls, ceiling and floor were insulated and nearly all interior surfaces were painted dark. In addition, a screen of dark weed fabric was hung vertically in the space. The fabric was suspended from near the peak and ran vertically down to the floor, and then extended along the floor south toward the glazing along the floor. The aim of the test was to get basic sunspace performance, and to see if adding the vertical screen is more efficient in getting the heat up to the peak area. The screen was also helpful in evaluating whether some form of screen is desirable to increase the comfort for people using the sunspace to (say) read or have a cup of coffee. The test also includes a stagnation test in which the fans and all ventilation are stopped to see how high the temperatures go. This configuration is nearly the same as configuration 2, except that for half of the day the dark weed fabric was just distributed evenly over the full floor. So, for this configuration, the sun could shine onto the north wall and north roof. Day 2 test configuration without the vertical curtain. This test was done earlier in the construction before some of the features above were incorporated. The glazing and shell were in place, but the floor was bare (heat absorbing) dirt, and the walls and ceilings were not insulated. Interior surfaces were bare wood, and not painted a dark color. The idea was to see how much it degrades the performance if not all of the features listed above are included. The sunspace does surprisingly well as a space heater. The sunspace with 200 sqft of glazing produced 233,000 BTU on one sunny day -- the equivalent of burning 3.6 gallons of propane in a 70% efficient furnace. The sunspace achieved efficiencies during the test up to 60% -- this is fully equivalent to good commercial active solar collectors operating under the same conditions. Pretty amazing when you consider that you get all the other benefits that a sunspace offers while still getting this very good space heating performance. This section in the day 1 test writeup goes over the heat output and efficiencies achieved in the test. It also provides two methods to estimate efficiency and heat output for conditions other than those of the test day. One caution is that this testing was done on a sunspace that was highly optimized for space heating -- optimally tilted double glazing, well insulated on all non-glazed surfaces, low thermal mass, tightly built, with all dark and low mass absorbing surfaces. Not adhering to this type of optimized construction will result in lower efficiencies and heat output -- the configuration 3 test (above) gives some indication of how much. Getting good performance data on solar heating collectors is challenging, and air heating collectors are even more challenging. Its right to be a bit skeptical about performance numbers you see around the internet. 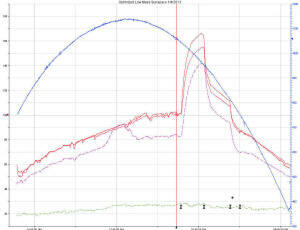 So, here is a rundown on the instrumentation I used -- so you can judge whether or not to trust the results. Sun -- Sun intensity was measured with an Apogee pyranometer that was mounted to the glazing frame and was perpendicular to the plane of the glazing. Apogee pyranometer mounted in plane of glazing. In this position, it directly measures the sun intensity on the glazing. This pyranometer is factory calibrated and is about 1 year old. Temperatures -- I used Onset Computer loggers with thermistor sensors to measure the temperatures used for performance calculations. These sensors specifications call for plus/minus 0.25 C accuracy over the range of interest. As a check, I generally put all the sensors together in the same location at the start of the test and make sure they read close to the same value. Areas -- Glazing area was measured with a tape, and the frames were included (not just net glazed area) -- this is in the SRCC style. See the test page for a little more on this. Flow Rates -- In air collector testing, getting good estimates for flow velocity is usually the most challenging measurement. I went through several iterations getting to an arrangement that I feel is giving decently accurate velocities. The final arrangement includes an about 11 ft long straight length of 10 inch duct on the exit of each of the two fans -- this provides 13 duct diameters of straight duct between the fan and the velocity measurement station. This lets the turbulent flow of the fan mix and settle down after leaving the fan. A 2 ft long flow straightener is used to take most of the fan swirl out of the flow. Before the flow straightener was installed, the swirl velocity was about 400 fpm and the axial velocity in the center of the duct was significantly lower than the axial velocities around the periphery. With the flow straighteners, the velocity profile is as expected with higher center velocity, and consistent velocities around the periphery. I take the velocity measurements with a new Kestrel 1000 turbine style anemometer. The Kestrels are high quality instruments that all receive an individual factory calibration before going out-- they are certified to be within plus/minus 1.66% for the velocity range I use. I take one reading in the center of the duct, and 4 readings around the periphery (up, down, North, and south). The 5 readings are simply averaged to get an estimate of the average flow. The center of the turbine is 2 inches from the duct wall on the four peripheral readings. I take these readings several times during the day -- they tend to be quite consistent. Typical readings would be 740 fpm center, with readings around the periphery that vary from about 530 fpm to 630 fpm, but the readings at each peripheral point are quite consistent from one reading to the next. The swirl component of the velocity is less than 100 fpm. The afterburner on the new sunspace propulsion system. I'm expecting it to do Mach 0.86 at 32,000 ft. It is (maybe) interesting to note that before the flow straighteners were installed, and with a lot of swirl velocity, taking the 5 readings in the same places as mentioned above -- each individual reading was markedly different than the after flow straightener readings, but the average of the 5 readings with and without flow straighteners was close. I may further check these readings with a Pitot tube survey, but the velocities are down in the range that are difficult to measure accurately with a Pitot tube. Past experience leads me to believe that the Kestrel is probably the best way to go. Air Density -- I use a density of air of 0.061 lb/cf -- this correction from the sea level standard conditions of 0.075 lb/cf accounts for our altitude of 5000 ft. and 80F air temperature. Based on this calculator. What is it Like to Live In? I spent the better part of several days in the sunspace during the testing, so these are some impressions of what it is to be in the sunspace while its in the process of gathering heat for the house. There were a lot of times when the sunspace was quite pleasant to be in. But, there were times near midday when the glare from the sun and reflection off the snowfield were a bit uncomfortable for me (this may be a matter of personal taste). I think that some form of shade cloth like screen that runs parallel to the glazing and can be deployed to filter the sun, or pushed to the side to let in all the available sun would be good. It would allow you to quickly adapt to full sun, part sun and light overcast conditions and to personal tastes. Another observation is that without the fans to remove the heat and send it to the house, the temperature in the sunspace would reach sauna levels in very little time after the sun gets on it. Some form of control over overheating is a must for these heavily glazed low mass spaces -- using the extra heat to provide needed space heating to the house is a win-win. Along these lines, the more flexibility you can build into the fan/ventilation system, the better -- multiple fans that can be staged, and/or variable speed fans, and a control system to match will help match the air removal rate to the solar input. But, I don't want to make this sound too complicated -- people build $20 sunspaces using a roll of poly film and are ecstatic with the results. Even though I would call the Dayton/Grainger fans I used relatively quiet, the fan noise would be objectionable for (say) reading the paper or having a conversation or just having a cup of coffee. Using fans that are very quiet, and/or muffling them, and/or getting them into locations that noise shield them from the sunspace is going to be important to enjoying the sunspace. As a place to hang clothes for drying, it would seem very good. The air is warm and is moving, which should reduce drying time, and it could be setup so that the sun shines directly on the clothing to further reduce drying time. One observation is that it does not take very much sun to warm the sunspace up to where its comfortable to be in. Even in some cloudy conditions that keep the sunspace from gathering enough heat to do much space heating, it was able to heat the sunspace itself to a comfortable temperature. Another thing that is no surprise is that that when sunset rolls around, the temperature in the sunspace falls like a rock. It very quickly becomes a very chilly place. If these characteristics are not what you want out of a sunspace, then you can alter the design to to the direction you want -- for example, adding more mass. The space heating produced by the sunspace will drop some when you do this, but if you get other benefits, that's fine. Sunspaces are very fallible -- its up to you to adjust the design to achieve the mix of functions you want. Each of the test write-ups (above) has a section on the comfort level of the sunspace during the tests, and include thermal images and temperature surveys to see what things are like over the course of a sunny day. This is a very rough idea what an attached sunspace modeled after the freestanding greenhouse in the pictures above might cost. Its based on what I paid for the materials for the GH, but adjusted down in places because the sunspace would not have a north wall. Its made from all new materials. It includes what you see in the pictures -- nothing fancy. Bear in mind that costs of low thermal mass sunspaces can vary over a huge range. There are a couple of examples of dirt cheap ones that can be built for $25 ish, all the way up to ones that cost a couple hundred or more per sqft. Thermally they all behave in a similar way -- the cost is more a matter of the look and feel that you want to achieve. - 200 sqft worth of commercial air heating panels (you install) -- roughly $10,000. - 200 sqft of DIY air heating panels with fans, ducts, ... $1500? Of course, the sunspace comes with all sorts of functionality beyond the solar heating, whereas the rest of the options just do heating. While the test sunspace as it is does a very efficient job of producing heat, there are some things that might improve it. Part of the solar radiation is absorbed by the glazing itself, and never gets into the sunspace. For good single glazing about 90% gets through, and for good double glazing a bit over 80%. So, you lose 10 to 20% off the top to glazing absorbtion. Heat loss out the glazing from the warm sunspace interior accounts for most of the rest of the reason we don't see 100% efficient collectors. This loss is partly conduction through the glazing from the warm air next to the glazing, and partly radiation at thermal wavelengths from the absorber toward the glazing. Reducing the temperature of the air near the glazing to reduce conduction heat loss through the glazing -- see Deep Mesh below as one example. Reducing the temperature of the absorbing surfaces, so that less heat is radiated out the glazing. Efficient transfer of heat from the absorber surface to the air is probably the main factor in reducing absorber temperature. Good airflow on the absorber, lots of absorber surface area, flow through absorbers (like screen), ... might all contribute to lower absorber temperatures. Selective surfaces that are often used in commercial active collectors that have low emissivity in the heat radiation wavelengths might also help. There are some glazing materials (like Teflon) that have higher light transmittance and might be used for the inner layer of glazing on double glazed sunspaces. One thing the sunspace already has going for it is that air velocities next to the glazing are quite low -- this reduces the efficiency of heat transfer from the air to the glazing, and that is good. Nick Pine's sunspace has a fabric mesh that is fairly close to the glazing. He introduces the supply air (probably around 65F) between the mesh and the glazing. The mesh has enough air resistance to spread the supply air over the full surface of the mesh. So, the sun heats the mesh, and the uniform airflow through the mesh takes that heat away. The desired end result is that the air next to the glazing and the mesh absorber will both run relatively cool, and that this will reduce heat loss out the glazing, which is what efficiency is all about. Hopefully as Nick gets further along with his sunspace we will get a reading on how well this works. If the sunspace is large enough to produce more heat than the home can use during a sunny day, It would be desirable to be able to store some heat in the sunspace for home heating use after sunset. While its easy to add mass to the sunspace to store heat, the problem is that with the normal sunspace design a lot of this heat will be lost out the sunspace glazing before it can be used by the house. Movable insulation on the sunspace glazing. This would reduce heat loss from the sunspace and would make the sunspace more comfortable as well as allow storing house heat in the sunspace without as much loss. There are some sunspace and greenhouse insulation curtain designs out there -- they tend to be somewhat difficult due to the large glazed area, but not impossible. Some of the commercial shades for home windows that have side tracks provide R values up toward 4 (US). 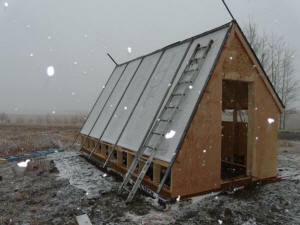 It might be possible to provide movable insulation over sunspace thermal mass. 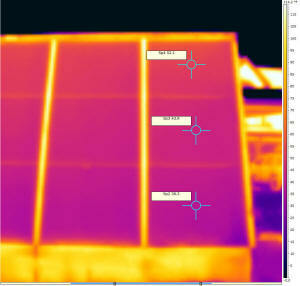 These insulation panels would be closed around the thermal mass to reduce heat loss after the collection period. 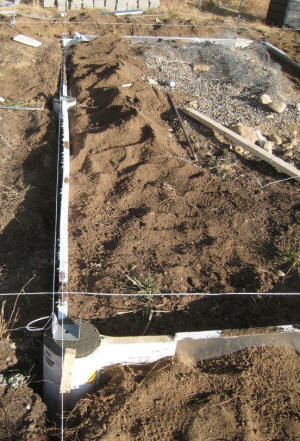 For example, one might have water barrels along the north wall for heat storage with an insulating curtain or panels that deploy after sunset to insulate the mass from the sunspace. Forced air circulation around the barrels would transfer heat to the house. Another possibility would be to just have a massive north wall that heats in the sun during the day, and has an insulating panel over it at night. This would be like a Trombe wall, and would transfer its heat to the house later in the day. The book Movable Insulation, Langdon is a good source of ideas for (surprise) movable insulation schemes. Of course, if the sunspace is modest in size and the home is large and heat leaky, then the thermal mass of the home will store some heat during the day without the house overheating, and it will give that heat back after sunset. An air system that picks up heat efficiently from the absorbing surfaces would help to keep the absorbing surfaces cooler, and would reduce heat loss out the glazing. Sunspaces provide a lot of room to work with, so maybe there is a way to direct airflow so that it picks up heat from the absorber more efficiently? An absorber that absorbs the heat from the sun efficiently and transfers it to the air efficiently will run cooler and lose less heat out the glazing. 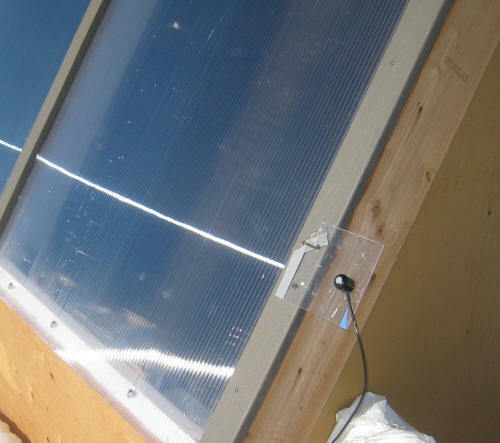 For example tests of flow through screen absorbers in DIY solar collectors have proven them to be a good deal more efficient than (for example) a bare black box. In this application, the sunspace is being used as an alternative to a conventional solar air heating collector to provide space heating. Its interesting to think about some of the contrasts. The flow velocities are much lower in the sunspace -- in most places I can't measure them with a good air velocity meter and you really can't feel them, but in a conventional collector, air velocities are fairly high -- up toward 100 fpm and more. In a conventional collector, there is usually a significant air velocity along the glazing, where as in this sunspace its too small to measure. The surfaces that absorb the solar radiation are spaced further from the glazing, are larger, and often run cooler. The flow pattern in a conventional collector can (it seems) be controlled with channels, baffles, screens. What would one do in a sunspace to control and direct the flow to the desired areas? The sunspace has more outer heat loss area and more potential leakage area. Do these differences offer some opportunities for greater efficiency? Got other ideas? Use the Comments section below or email me. Low mass sunspaces can be very good space heaters for your home -- equivalent to high quality active solar collectors of the same area. Performance takes a significant hit if the design guidelines are not followed. The environment in a sunspace that is designed as an efficient space heater can be quite comfortable and useful for SOME other functions while still providing lots of heat. There is likely some opportunity for improvements in the design. The measured heat output and efficiency of the optimized sunspace was close to identical to a very good commercial solar water heating collector operating under the same conditions. I think this is a heck of a deal given that you can also use the sunspace for a whole raft of other useful functions. While I was expecting the optimized sunspace to do better than the non-optimized sunspace, I was surprised by the size of the difference. The non-optimized sunspace with no insulation, no dark painted surfaces, and a heat absorbing (wasting) floor had an efficiency of about 20%. The optimized sunspace with improved hot air removal (2 fans), R28 wall and ceiling insulation, insulated floor, and all dark absorbing surfaces showed an efficiency of about 55% under similar conditions. Nearly 3 times the heat output. For the insulation, the total area to be insulated is about 300 sf. If you assume that the average inside temperature is 70F and outside is 30F, and that the current plywood walls are R1, then the heat loss is (300sf)(70F - 30F)/(R1) = 12,000 BTU/hr. The total solar incident on the 200 sf of glazing is about 60000 BTU/hr, and you would expect to only harvest about half of that in a good collector, so the 12K BTU/hr is a significant fraction of that. In a true attached sunspace, these losses would not be as bad as it was for our simulated sunspace because the attached sunspace shares its north wall with the house. With the sun in its current low elevation, only about 18/115 = 16% of the solar incident on the glazing at noon hits the floor of the sunspace. This is about (0.16)(70K BTU/hr) = 11000 BTU/hr directly incident on the floor. If a sizable fraction of the 11K BTU/hr is absorbed by the floor and heats it, that is a sizable loss of heat to the house. The heat wasted in the sun heating the ground mass would increase as the sun gets higher in the sky because a larger fraction of the incident solar hits the floor. I have heard reports from sunspace owners that some form of insulating cover on the floor does actually make a significant difference in performance. I guess the message is that there is a reward in heat output for minding the details. There are times when you may well chose to go away from the optimal design for space heating to pursue other benefits, and that's fine as the sunspace is a multi-function gadget and you may well be willing to sacrifice some house heating to gain in other areas. If you have a sunspace and are up for taking some pictures, doing a description, and (hopefully) some performance measurement, I'd love to add it to our collection.